When a search for her deceased brother’s belongings causes her to stumble into a hallway that isn’t supposed to exist, Philadelphia is faced with a question she doesn’t want to answer – the choice between returning to Earth or destroying it. 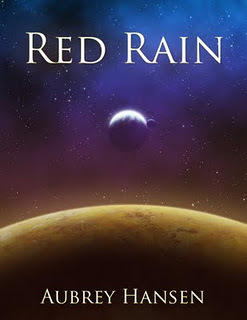 Aubrey’s Hansen’s debut novella Red Rain burst onto the scene in early September to favorable reviews. My interest in the premise – coupled with the fact that I’m fairly well acquainted with the author – compelled me to read the story for myself. And I wasn’t disappointed. Red Rain takes place in a futuristic dystopia, where Earth is run by a single, worldwide government: “United”. Christians are regarded as outcasts, marked for persecution and discrimination. Most are forced to attend special ”re-education” camps. Those who choose to compromise are welcomed back into society; those who don’t are subject to greater hardship than ever. “Assimilated or removed,” as the saying goes. It’s a superb backdrop for an interesting tale, and Aubrey handles it all quite well. The plot is briskly paced, cutting from one scene to the next with economic precision: kudos to the author for keeping the story on track and not allowing herself to be distracted. The small cast of characters is well-rounded and memorable, from the young heroine Phillidelphia to the coniving Dr. Nic. The prose is generally tight, clean, and devoid of clutter; and Aubrey demonstrates a remarkable talent for crafting smooth dialogue. There were some lines here and there which came across as a bit melodramatic, and one or two scenes which I thought could’ve used polishing; these, however, are minor complaints when considering the overall excellence of the book. The primary theme of the book is the danger of compromise, as Phillidelphia is tempted multiple times to renounce her faith and choose the “easier” path. I appreciated Aubrey’s inclusion of this, as it lent the story substance and gravitas that would otherwise have been lacking. I might add that there is nothing – no indecency, no bloody violence, no cussing – to make this book unsuitable for younger readers. I enjoyed it, and yet I would have no reservation about handing it to my 9-year-old brother. It’s an all ages type of read. In conclusion, therefore, I highly recommend Red Rain. It’s a fun, clean, and engaging little piece of fiction – the perfect way to spend a quiet afternoon with a cup of tea and your own imagination. Rumor has it there are a couple of sequels in the works. I hope such is the case: Aubrey Hansen has shown us why we should pay attention to her, and I look forward to reading more from her pen. Thanks so much for your thorough review, Corey. It was extremely helpful and encouraging!